The challenge of partitioning processing between the edge and the cloud is beginning to come into focus as chipmakers and systems companies wrestle with a massive and rapidly growing volume of data. There are widely different assessments of how much data this ultimately will include, but everyone agrees it is a very large number. Petabytes are simply rounding errors in this equation, and that soon will be replaced by exabytes at current growth rates. Even storing that much data goes well beyond the capabilities of the largest supercomputer, which currently has about 200 petabytes of storage, Gupta said. To handle all of these bits, at least some processing has to be done at the edge. It takes far too much time, energy and money to move it all—and the bulk of it is useless. But so far there is no agreement on how or where this will be done, or by whom. Cloud providers still believe hyperscale data centers are the most efficient tool to grind down the mountains of operational data produced by IoT devices every day. Device makers, in contrast, believe they can pre-process much of that data at or close to the source if they can put a smart enough, purpose-built machine learning inference accelerator in the device. One of the new terms is edge clouds. But that’s not the only place where intelligence will be added in order to process some of this data. So far, there is no agreed upon demarcation point for where the edge begins or ends. For some experts, it starts at the sensor. For others, it may be a corporate campus or some other private cloud. This has set off a scramble on the infrastructure side to enable “pervasive intelligence,” an updated version of IBM’s old “pervasive computing” idea. The basic problem is that the existing infrastructure never will be fast enough or reliable enough to send all of the data from a moving car to the cloud and back again in time to avoid an accident, even with millimeter-wave 5G. But it’s not out of the question to send a warning from one vehicle to another that isn’t visible yet to avoid an object in the road or to slow down because there is an icy patch around the next bend. That’s only one piece of the puzzle, even though it’s a necessary one. Fitton noted that during a 12-hour flight a commercial airplane can generate 844 terabytes of data. Figure 1. 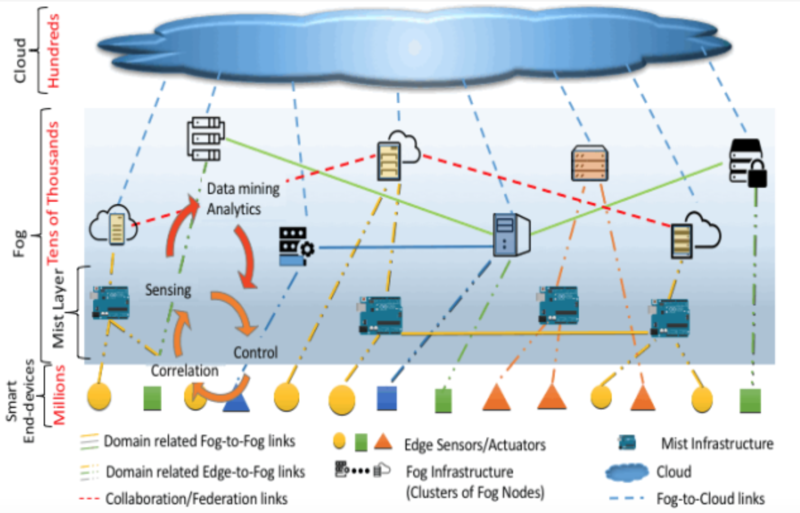 Fog computing supporting a cloud-based ecosystem for smart end-devices. Source: National Institute of Standards and Technology. Faster Ethernet and SerDes will keep things moving when it needs to, as well. In fact, the speed at which data will travel is set to increase from 50 gigabits per second today to about 400 gigabits per second by 2021, and it could double again with optical technology, according to Andy Bechtolsheim, chairman and chief development officer at Arista Networks. What’s particularly significant in this market is that today’s leading-edge switching technology was developed at 28nm using custom hardware. But the switch market is expected to shift to 7nm merchant chips over the course of the next two years. Because those chips are less expensive than custom silicon, he said it will cause a “dramatic ramp up in a very short time” of both performance and throughput. Other economic factors are at play here, too. He said that moving to new silicon will cause a 10X decrease in cost per port. At the same time, a single 400Gbps pipe is cheaper to develop and maintain than 4–100Gbps pipes. This is going to drive continued movement of data everywhere, and while more data certainly will be processed locally, more data will still be moving to the cloud than is processed on premises. Also entering into the edge discussion is how to secure that data. The general thinking among security experts is that data is at greater risk when it is in motion, regardless of whether that risk includes outright theft or simply data leakage. The difference is that what is considered state-of-the-art encryption today will be relatively easy to crack with future generations of computers. And the less data that is in motion, the less likely someone will be able to collect it and store it. Marvell started out working with the public cloud, but it has since migrated this thinking into the private cloud. Along with that, a unique identifier is injected into a chip during manufacturing to create keys for that device. “You can do this for multi-core processors, too, where each core does something different,” he said. Putting all of these pieces together creates some new opportunities for chipmakers. But more intelligent edge design also adds some interesting challenges. The flood of special-purpose accelerators from companies like Google, Alibaba and Facebook, as well as chipmakers, is a recognition that general-purpose chips are not sufficient to achieve the necessary performance for inferencing in a wider range of devices, or to add vision or speech recognition in cars, doorbells and smartphones. But even looking just at inferencing in endpoint devices doesn’t make processor choices automatic, said Geoff Tate, CEO of Flex Logix. The performance of inference models created from deep neural-networks trained on large datacenter servers depends on the algorithms, but also whether parts of the matrix multiplication is handled using 16-bit or 8-bit integers, or floating-point calculations — or whether the chip is designed in such a way that it can’t get up to full performance for the first tenth or quarter or third of a training cycle in which the same matrix calculations are run tens of thousands of times. What’s needed are standards defining issues such as latency, and the architecture of compute-intensive tasks that could be handled somewhere other than an endpoint or the cloud. Put in perspective, the need to collect and efficiently scrub, massage and analyze large amounts of data isn’t new. But questions about which device, and in what context, data needs to be analyzed never really affected large-scale systems or processor-purchase decisions in the past, said Susheel Tadikonda, vice president of networking and storage at Synopsys. Sending everything to the cloud or a centralized data center was always an obvious and largely bulletproof decision. In fact, it only became a point of discussion when the real or potential volume of data grew high enough to make bandwidth and cloud-processing costs a bigger part of the discussion. No one would be talking about having security cameras or gateways that act as server for 1,000 temperature sensors play a significant role in data processing if the number of devices collecting or contributing data hadn’t become so extreme. Some of the end-user customers that own those IoT devices have been collecting large amounts of data for decades, but only in the last few years has it been possible to analyze that data well enough to get the kinds of benefits in predictive maintenance and supply-chain efficiency that big companies can benefit from now, according to Robert Golightly, product marketing lead at Aspen Technology, which develops tools to squeeze greater efficiency from industries that are already quite good at efficiency. The benefits are often clear enough, but the logistics, architecture, design, cost models and performance metrics are often missing. This is especially true for the IT people who often take the lead on the non-traditional parts of an IIoT project, according to Matt Vasey, director of AI and IoT business development at Microsoft and former chairman and president of the OpenFog Consortium. “That’s one reason the OpenFog consortium focused on creating a standard,” Vasey said. “Manufacturing has been one of the first industries to make inroads into the IIoT because it was understood how to automate those processes, which were often documented,” Vasey said. Architectures and ideas about them are all over the place right now. Not every organization puts inference or storage or processing power at every tier of their infrastructure today, but the volume of compute resources in those tiers and in edge computing gateway server facilities is growing. Understanding 5G’s benefits, limitations and design challenges. Balancing different variables to improve performance. Getting 5G standards and technology ready are only part of the problem. Reducing latency and developing applications to utilize 5G have a long way to go. Real products are starting to hit the market, but this is just the beginning of whole new wave of technology issues.